Mant J, Al-Mohammad A, Swain S, Laramee P; Guideline Development Group. Management of chronic heart failure in adults: synopsis of the National Institute for Health and Clinical Excellence guideline. Ann Intern Med. 2011;155(4):252-259. PMID: 21844551 www.ncbi.nlm.nih.gov/pubmed/21844551. Riegel B, Moser DK, Anker SD, et al. State of the science: promoting self-care in persons with heart failure: a scientific statement from the American Heart Association. Circulation. 2009;120(12):1141-1163. PMID: 19720935 www.ncbi.nlm.nih.gov/pubmed/19720935. Arteries carry oxygenated blood away from the heart to the tissues of the body; veins carry blood depleted of oxygen from the same tissues back to the heart. The arteries are the vessels with the "pulse", a rhythmic pushing of the blood in the heart followed by a refilling of the heart chamber. 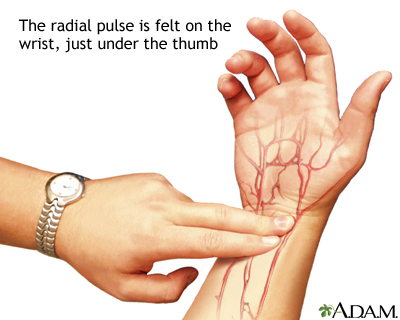 To determine heart rate, one feels the beats at a pulse point like the inside of the wrist for 10 seconds, and multiplies this numbers by six. This is the per-minute total.